As you may have heard, about half a million people in the Toledo, Ohio area lost their municipal drinking water supply on Saturday because of possible microbial toxin contamination from Lake Erie. A combination of heavier spring rains, exacerbated by climate change, and runoff of phosphorus from fertilizer applied to crops is the likely cause. The good news is that farmers can adopt better practices to eliminate this problem. The bad news is that the agriculture industry, and the public policies that it lobbies for, work against these solutions. A toxic microbe, or cyanobacteria (a.k.a. blue-green algae), has been causing big water problems in Lake Erie and other bodies of water around the country for the last several years. Scientific research pointed to the combination of agricultural and climate change as the cause of the historic 2011 toxic Lake Erie microbe “bloom” and subsequent dead zone. And research shows that farm pollution, which feeds the explosion of toxic microbe growth, especially from phosphorus fertilizer, has been increasing since the 1990s. 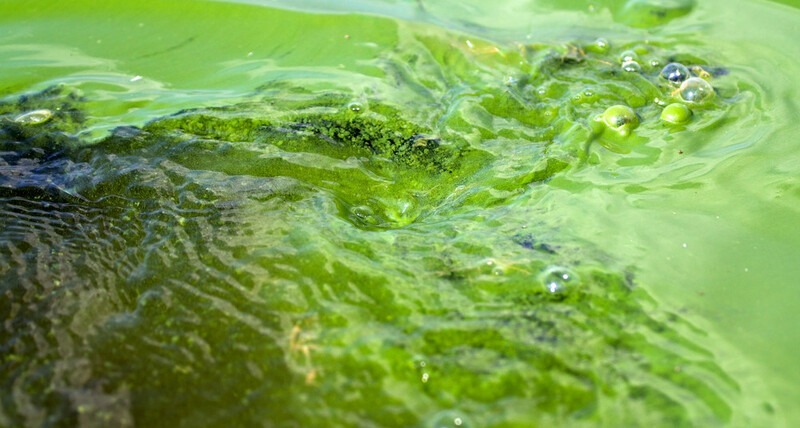 Now, new research published in the Journal of Great Lakes Research has further solidified the connection between industrial ag, climate change, and an explosion of toxic algae. While the most dramatic news this week is the city of Toledo’s move to shut down public water sources, there are other important impacts such as harm to commercial and sports fishing and recreation at the lake. After the microbes die, other bacteria consume them, using up much of the oxygen in large parts of the lake in the process. The resulting dead zones kill fish and other lake life, and harm fisheries. The toxins close down beaches, and the foul odors and bacterial slime often discourage beachgoers even in places where they remain open. On Monday, several news sources reported that Toledo residents could once again drink from their taps, but the algae bloom continues. And the recent research cited above suggests that even if phosphorus levels were reduced enough to limit blooms, further reductions would still be needed to bring the dead zone in Lake Erie back to pre-1990s levels. Dead zones like these are not unique to Lake Erie. Water pollution from phosphorus is harming Lake Winnipeg and many reservoirs. There are also about 400 global marine coastal dead zones, caused mainly by nitrogen fertilizer, including one in the Gulf of Mexico that is measuring the size of Connecticut this year and another large one in the Chesapeake Bay. Yes, we can purify the water, but it costs millions of dollars and does nothing to help the lake itself. For that we need to get to the source. Ironically, these toxic microbes are growing thanks to an agricultural practice that is widely touted as an improvement in the sustainability of industrial agriculture—conservation tillage and no-till farming. As their names imply, these are approaches to farming that require farmers not to plow the soil with tractors, but rather to leave it in place and kill weeds in other ways. They are often practiced in concert with the use of herbicides and genetically engineered seeds. Genetic engineering is sometimes given credit for the adoption of no-till, but the practice actually started to become widely adopted years before genetically engineered (commonly known as GMO) crops were commercialized. Nonetheless, engineered herbicide-resistant crops made conservation tillage easier in many areas (until the advent of glyphosate herbicide resistant weeds, that is). So the tarnishing of no-till also diminishes one of the main purported benefits of GMO crops. No-till usually reduces soil erosion, which is a very good thing. Many farmers and scientists also believed that it would reduce phosphorus pollution because that nutrient binds tightly to soil. So reduced erosion should also reduce the amount of soil washed into streams carrying bound phosphorus. Unfortunately, when phosphorus fertilizer is not plowed into the soil, it builds up at the surface, and from there it can be more easily washed off soil into streams and lakes. This is because this form of phosphorus, called dissolved reactive phosphorus, is not bound to soil. It is also more easily utilized by the toxic microbes in lakes and waterways. What About Factory Animal Farms? Industrial corn and soybean production are clearly linked to the problems in Lake Erie via fertilizers. But factory farming of livestock is also suspect. Concentrated animal feeding operations (CAFOs) have a manure problem. Because so many animals are confined in such as small area, they often produce far more manure than can be applied to the surrounding farmlands without causing runoff. That means more nitrogen and phosphorus gets into streams. When livestock farms were smaller, and more dispersed geographically, manure could be used to fertilize nearby crop fields in a balanced way, but today CAFOs are large and often located near one another. And it is simply too expensive to transport manure far enough to spread onto fields in amounts that won’t end up in streams or groundwater. Although the role of CAFOs in the Lake Erie microbial blooms has not been quantified, Ohio has many CAFOs. And the overlap between the location of most Ohio CAFOs and the Maumee River watershed, the source of most of the phosphorus that causes the blooms, is striking. We have the solutions to these problems. Agroecology, or farming that uses principles of ecology and includes organic, relies on organic sources of crop nutrients, and integrates livestock and crop production in ways that are much less likely to cause phosphorus or nitrogen pollution. It is possible to use too much manure on organic farms too. But the integration of crops and livestock works against pressure to overuse manure on too few acres, as with CAFOs. Organic farms also often rely on cover crops, which literally cover otherwise bare soil and absorb excess nutrients through their roots and can also make a big difference. Collectively, these methods have been shown to greatly reduce nitrogen pollution. And preliminary data shows reduction in phosphorus runoff as well. We need more research to examine this further, and to learn how farmers can efficiently use these methods. We also need farm policies that reward farmers for adopting methods with multiple benefits for the environment, society, and public health instead of continuing to subsidize corn and soybean overproduction and pollution. Agroecology-based farming methods not only reduce water pollution, they reduce or eliminate pesticide use, and can reduce global warming emissions. And they have been shown to be profitable and highly productive. The lesson from Lake Erie is that piecemeal fixes like no-till, though they have some important benefits, will not fix a system that is fundamentally broken. We need systematic change, not band-aids. Addendum: The new paper on the sources of phosphorus pollution in Lake Erie, points to manure as an important source of phosphorus in the eastern part of the Lake, rather than the Maumee River basin in the western part of Lake Erie (Figure 13). The Maumee River Basin phosphorus is predominantly from agriculture sources, as noted in the blog post, but according to the paper, mainly from fertilizer (the post does note that fertilizer is the overall main source of agricultural phosphorus pollution). This does not affect the main points in the blog that agriculture, and no-till combined with heavier precipitation, are major sources of increased phosphorus entering the Lake since the 1990s. But it does strongly suggest that the correlation between CAFOs and the Maumee River basin is just that—a correlation and not a cause. I will risk dating myself but Lake Erie was once considered "dead" due to vast algae blooms fed by phosphorus. That was back in the 70's as I recall. At that time it was proven most of the phosphorus was coming from laundry detergents and other household products. Phosphates were banned from detergents and Lake Erie quickly recovered. Since then development around Lake Erie has soared and there have been occasional algae blooms fed by nutrients mostly from excessive lawn fertilization and leaky septic systems. Development of the Lake Erie watershed has crowded most farms out of existence. The livestock yards and corn fields are long since suburbs and strip malls. I think it is great to hammer evil farmers but that won't fix Lake Erie again. I'd like to see the citation for the claim that no-till fields have phosphorus sitting on the topsoil, ready to be washed away. IF that's true, it seems like the type of phosphorus being used would be the culprit rather than the no-till method. Cover crops are hugely important to no-till systems. Farmers use no-till methods for non-GMO crops like wheat, and when a GMO seed source is available, it's not a given that it will be selected by the no-till farmer due to price and other factors. Unfortunately, you are simply wrong. The data measuring both agricultural land us in critical parts of the Lake Erie basin, as well as phosphorus measurements from the watersheds draining those areas contradict your point. Most of the phosphorus that is having the toxic and other affects in the Lake Erie western end and central basin (these are the most affected parts of Lake Erie) is coming from heavily agricultural areas. Urban contributions and septic tanks are a minor part of this problem. There are lots of data on this, contrary to your anecdotal observations. The single best citation for summarizing the connection between no-till and increased dissolved reactive phosphorus (and total phosphorus) is: http://www.indiaenvironmentportal.org.in/files/file/algal%20bloom%20in%20Lake%20Erie.pdf , see p. 6449, column 2, for example. But there is discussion of this throughout the paper. There is also some discussion in the newer paper that I linked in this post. The issue is not the form of phosphorus applied to fields, but how that phosphorus interacts with soil or other organic matter afterward. By staying at the soil surface, there is more that is not tightly bound to soil particles, and it is also physically in a position to be washed off. One factor that I haven't heard being discussed but could also be playing a role is the lack of natural buffers between farm lots and water sources in many areas. If you look at satellite imagery, algae blooms are also prominent along parts of the northern Lake Erie shoreline. I recently flew over this part of Ontario and was struck by the scarcity of woodlots, wetlands or other undisturbed natural areas. It's simply farm after farm after farm. NW Ohio is similar. I'm no expert, but isn't it a good idea to leave natural buffers near water sources to absorb pollutants, runoff and prevent soil erosion? Space did not permit a full answer to Jennifer's points above. In addition to being incorrect about the sources of phosphorus pollution (yes, it is mostly from farms), the other point is that farmers should not be blamed. They are mostly trying to do the right thing and make a living. As I noted at the end of my post, the problem is mostly outdated agricultural policies and subsidies that encourage the wrong farming practices, and discourage the better ones. Give farmers the tools and they will do the right thing. Looks like it's the case of those who pay farmers to farm in a certain way (to lower final product costs) finally paying some of the normally externalized costs. All of Ohio agriculture is concerned about water quality. The situation that happened last week in Toledo was terrible for all involved. Healthy Water Ohio was established this past spring to show how the farming community is and will always be involved in identifying any issue that could effect water quality. Very interesting article, although this video shows me that no-till does the exact opposite of what you're saying it does.